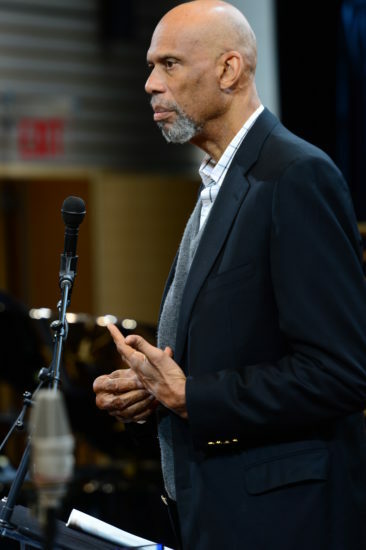 On Jan. 11, in Jazz at Lincoln Center’s Appel Room, basketball legend and author Kareem Abdul-Jabbar gave the keynote address at the first edition of Jazz Congress, a two-day event presented by JALC and JazzTimes. Included here are highlights from that speech. For more on the Congress, which featured industry panels, learning sessions and more, see the photo essay at jazztimes.com or visit the conference website. Jazz has been the musical narrative of my life. My love of jazz stems not just from the music itself, but from its history. The music connects me to my own thoughts and feelings but also connects me to my cultural history. Jazz is the original soundtrack of the black experience in America. It expresses the hardships, frustrations, rage, melancholy, unity and hopefulness. Jazz was the popular voice of the Harlem Renaissance. Its rise in popularity called attention to the black writers and artists giving African-Americans more respect as intellects and artists. It changed white perception of blacks. After World War II, small, intimate jazz bands replaced the big bands. Instead of dancing, people listened to the music. They appreciated the artistry and intellect of the music. Part of the reason we’re here today is to discuss ways to share our passion for jazz with the rest of the world. One way is for jazz to reclaim its place as the soundtrack of social progress. Jazz has always been the sound of rebellion, of inspiration, of innovation. The jazz community has to embrace this role and become more active in aligning with and promoting social justice movements. Passive endorsement is no longer enough. Following the inauguration of President Trump, the Washington Post changed its slogan to “Democracy Dies in Darkness.” We could also say that “Democracy Dies in Silence.” People need to speak out about every form of social injustice. Just as athletes are taking a stand by taking a knee, musicians need to speak out—and often—about the inequities that inspire some of their music. It’s important today that we embrace the many others in the larger community that also are suffering: immigrants, the LGBT community, those of different religions and ethnicities. Jazz should become the music of liberation because jazz is about liberation—liberating your feelings, your soul and your body. The #MeToo and Time’s Up movements tell us that there is no industry immune to the mistreatment of others. This is especially heinous in the jazz community, because our art is born out of the pain of being mistreated and marginalized. Surely we must do everything possible to ensure no woman feels she is without power, substance or value in any aspect of our industry. And I don’t think we should leave that up to the goodwill or intentions of people in power. We can’t allow this monumental moment to erode. Feel-good moments of empowerment can fade and people will regress unless we take concrete steps. We need a formal document that spells out appropriate and inappropriate behavior and the penalties for the latter. We need to educate the next generation that the joys of jazz are greater than those of K-pop and other music trends. Most courses teach students how to make a living; art and music teaches them how to enjoy life. [We need] more outreach programs in schools—especially since Trump recently proposed severe budget cuts that could eliminate many music and art programs. We need a much more comprehensive and intensive [education] program. It will require a lot of volunteers. But we will be bringing joy to the community, perhaps inspiring future jazz musicians and creating a lot of new customers for your music. So I’ll leave you with what jazz is to me. Jazz is the perfection of imperfection. It acknowledges the cracks in the sidewalk of humanity, the flaws in the diamonds of our souls, the tectonic faults in our personal relationships—and forges all those discordant notes into something greater and stronger than the sum of those parts. In the end, jazz not only makes us feel better—it can also make us be better.